I recently had the pleasure of taking a mini vacation to West Texas. I had always wanted to visit Marfa, a renowned art city in the middle of the desert. After Marfa, I drove north to Alamogordo, New Mexico and ran around White Sands National Monument, not to be missed if you have the time. What is Marfa and how do I get there. Marfa is a small artist town in West Texas on the edge of the Chihuahuan Desert. Made popular in the late 70s by minimal artist Donald Judd, it has attracted artists and adventurers ever since. A flight to El Paso International Airport will get you pretty close. Rent a car and take the three hour scenic drive east along Route 10 before heading south on Route 90. Make sure when planning a trip to visit during the weekend. Most shops, galleries and restaurants are open on the weekends, some only keeping weekend hours. Sundayafternoons and Monday's tend to be quite sleepy around town. Stop by the visitors center for a list of restaurants with the days and hours of operation. There is also plenty of information on galleries and what to do around town, like visiting the Marfa Mystery Lights. Here is what I did on a two night vacation in this wonderful and wacky town. El Cosmico is a sprawling nomadic campground. Accommodations range from Safari Tents, to Teepees to Trailers of all shapes and sizes. Its a place like nothing else you will ever stay, and it radiates magical energy. Though I had my heart set on staying in a teepee, I was afraid I would have been too cold. Instead, I booked two nights in a small trailer, the Amigo. It has a very tiny kitchen inside, with running water to the sink. The toilet however, was just outside next to the outdoor shower. Thankfully there is an indoor shower in the main lodge for those chilly mornings. My little trailer was so cozy and comfortable and warm. With its kitchenette, I was able to make hot tea. Sipping tea and listening to Marfa public radio while watching the desert sun set was such a relaxing part of my vacation. Inside the main lodge is El Cosmico Provisions an eclectic and well crafted store carrying everything from Marfa Brand Soaps to locally made jewelry to everything in between. A few times a year they host large events like the Trans-Pecos Festival of Music and Love. Do not miss the amazing falafel to come out of this truck. Super delicious Mediterranean inspired fare. There are plenty of outdoor tables, and if its too chilly to eat outside, a converted school bus turned dining hall is nice and cozy. Great breakfast spot. A Scandinavian inspired chocolate spot, though the menu is much more then just tasty hot chocolates. I had a fresh squeezed juice and perfectly scrambled eggs with homemade grainy bread. This is a hotel, bar, restaurant and home to the Marfa Book Company (a well curated selection of books and locally made items) inside as well. This is definitely one of the pricier places to eat in Marfa, but my waygu beef burger with bacon jam was worth every penny. Bakery and flower shop located on the edge of town. Traditional breakfast and lunch fare in hungry people portions. I had the huevos rancheros.. and holy moly.. so good.. so spicy. Perfect eggs on corn tortillas topped with a pile of green chilies, served with beans, potatoes and a flour tortilla to sop up all the goodness. Amazing coffee and toasts. Make sure to get there early before they run out of food. Cozy indoor seating near a wood stove or outdoor seating in or out of the sun. Go to a Star Party, and make reservations on line before you go. The tour begins at the outdoor amphitheater. (I suggest bringing a blanket during the winter months) A knowledgeable guide talks about and points out constellations, and if you are lucky enough get to see the International Space Station pass by. Next, you'll be able to view different stars, nebula and the moon through a few different telescopes. The observatory is about a 45 minute scenic drive from Marfa. This is a site specific installation by artists Elmgreen and Dragset. It was established in 2005 and is a "Prada Store" in the middle of the desert. It is 37 miles from Marfa on Route 90. You cant miss it, on the side of the highway on your way to Marfa from El Paso. This is what brought me to Marfa...wanting to see Donald Judds' concrete sculptures in the middle of the desert. Well, not the middle of the desert, but a permanent outdoor installation, in an open desert field around the corner from El Cosmico. I highly suggest taking tours at both the Chinati Foundation and at the Judd Foundation. You will get a comprehensive overview of Donald Judd, his work, life and work space. There are so many galleries hidden everywhere in Marfa. Ballroom Marfa is a great space, and the Ayn Gallery in the Brite Building just to name a few. There are also hidden installations all around the city, like the fake gas station, where the price for gas is ART. 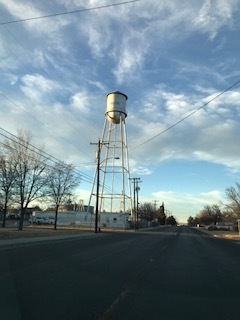 Marfa is such a fantastic town for walking around, getting "lost" and exploring. Everywhere is beautiful, from interesting architecture to big blue sky and desert. After a day of galleries stop into a local bar, grab a tequila and make some new friends.